We're on issue 3 so far and it seems we've recieved a good response to this news format, so it is my pleasure to continue to serve as your NewsGrid editor. For this month we've got some great updates in a number of areas, but I won't spoil it for you yet, so without further ado, welcome to the August issue of the Fate of the Galaxy NewsGrid! I hope you enjoy. This month we've seen the completion of a couple models, which are now in the process of being textured. As time has gone on it's been great to see the progress of the team, our skillset has definitely improved, and as a result, this month seemed to be the month to revisit our efforts from when we first started this mod, and give them a facelift. 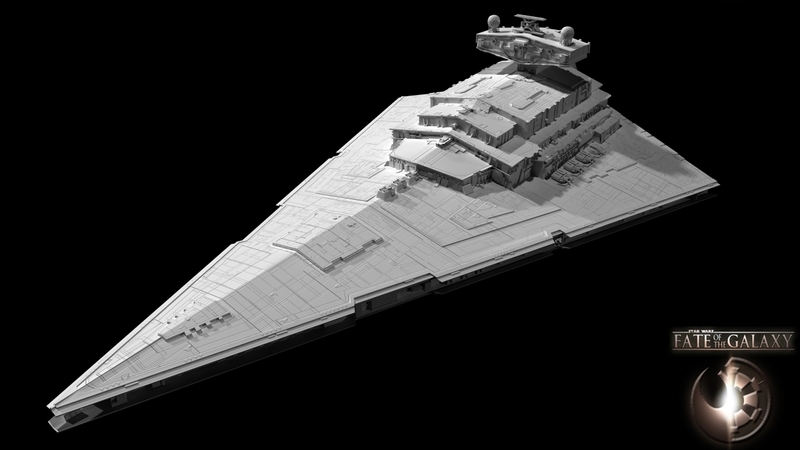 The Imperial I-class Star Destroyer mesh is now complete, and in the process of texturing. In addition, Turambar has continued texturing the A-Wing, and it's looking very slick, and maje has completed his Z-95 mesh as well, which is also being textured! All in all another great month on this front! This month we're proud to present a few more planet backgrounds! This month we're taking a look at Axem! Axem, who is really named Joel Reimer, but prefers not for anyone to know, is an artist working on the Fate of the Galaxy project, and will be assisting in FREDing once the time comes. When he heard of the old Star Wars Conversion mod, he wanted to join the team, but felt that his skillset was not up to par with the other developers, and chose instead to wait. Now years later Axem offerred his services to the new Fate of the Galaxy team. Sources say that Axem may be a clone of Chief, given his strangely similar backstory. He was originally a Star Trek fan who was converted to the light side after picking up a copy of X-Wing vs. TIE Fighter in 2000. He has never looked back since to that dark time he spent as a Trekkie, and prefers not to talk about it. He works as a "Dumb Parts Guy's Assistant," a position which uses his hyper intelligence and genetically engineered strength to its fullest. He also polices idiocy among his clients, often with lethal results. His other contributions to the FreeSpace Open community include working on Starfox: Shadows of Lylat, and the Just Another Day campaign series, for which he is being tried for war crimes after they were used in interrogations of suspected Al Qaeda members. Axem lives in Winnipeg, Manitoba, and claims to be Canadian, although most other Canadians will tell you Winnipeg isn't a real part of Canada anyways. Confirmation of his clone status is awaiting results of a DNA test. He also does not wear suits, and will likely be terminated from the project because of this. Fate of the Galaxy is still hiring! The following positions need to be filled. If you are interested in joining the team, please do not hesitate to contact either myself (Brandx0) or chief1983 via personal message, or by a new topic on the forum. We can also both be reached on IRC, at #scp-swc on EsperNet. Previous experience and examples of completed work are an asset, but not a must. Remember, the faster these positions are filled, the faster the mod will be released! See the Forum Post for further details. Please also note that we are not currently accepting applications for the following: FREDers, Modelers, Texturers, or "Idea guys"
I love you with a highly symbolic torpedo up the exhaust port"
The Tatooine and Axem pics are 404. My community contributions - Get my campaigns from here. "Truth" is the opinion of the majority which it can enforce on the minority. Members of the minority have two choices: join the bandwagon or think. Those who do not fall into line will be brutally crushed. I can see 'em just fine. Brandx, I've gotta say, those planets are mighty good. If they don't make it into the final release, I will smash something. The A-Wing and Z-95 are looking good too. Timin it by the seconds. Axem's picture is my favorite. hey, are you gong to do a september edition? just wondering, the other few have been out in the first couple of days of their months. Yeah unfortunately I've been very busy with work lately, and simply haven't had the time. I suspect there won't be a September edition, by the time I get it done it'll be too late heh. I'll probably do a mini mid-month update though in the next week or two. Whoo! Thank God, Now I don't feel like I'm under any pressure to finish the GR-75 at least for another two to three weeks.....considering I hit a snag last Sunday and haven't done anything since. Well there are many different speculations going on about this law about not mixing fibers and at least one explanation claims that it was a symbolic gesture designed to keep a pure sense of culture, people, and religion. Seperation of crop in the vinyard, mentioned in Dt. 22:9 and 22:10 seem to reaffirm this idea, though there may be other reasons as well. And now, an excerpt from the Prayer of Mordecai, the Book of Esther Chapter C (New American Bible Official Catholic version). Est C:5 You know all things. You know, O Lord, that it was not out of insolence or pride or desire for fame that I acted thus in not bowing down to the proud Haman. 6 Gladly would I have kissed the soles of his feet for the salvation of Israel. 7 But I acted as I did so as not to place the honor of man above that of God. I will not bow down to anyone but you, my Lord. It is not out of pride that I am acting thus. Lol dude, I think your enthusiasm is great, but just don't burn yourself out on it here. It's done when it's done. Is there no Newsgrid for this month? "Less than three is in the air..........every where i look around"
Probably not, Brand's been busy. Whoaa! I love the Couruscant planet Will the creator show us a way how did he do it?